Not long ago a student told me that he finally understood the importance of thinking we are wearing a yoroi when training the tachi kumiuchi techniques in the dôjô. Since 2003, each black belt in my dôjô have been wearing the yoroi on a regular basis and they have experienced physically how to train with it. When you wear the yoroi, your movements are modified and you cannot move as freely as when you only wear your gi. Many practitioners have a tendency to move only their arms and/or to keep them too close to the body this is wrong. With the yoroi the extension as well as the bending of your limbs are limited. Imagine that your torso and your arms draw a pentagon (a geometrical shape with five sides). the five sides are: chest,left arm, left forearm, right arm, right forearm. Each angle between two sides is a body joint (shoulder, elbow). 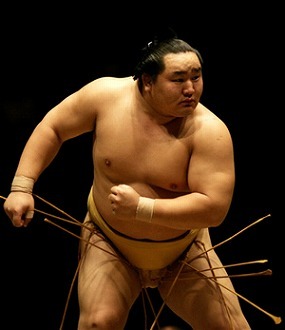 Because of the encumbrance of the yoroi your arms are always extended (not fully) and limited in their movements. It is as if your uppe body could not move indepedently. This is why the key in yoroi fighting is footwork. Your shoulder line is always parallel to your hip line making your walking look strange. Because of the yoroi the Japanese developed the famous nanba aruki or way of walking where arms and legs move one side after the other and not in opposite way as we do in the west (left arm with left leg and right arm with right leg). You can still see this way of aruki in use with the sumotori. Actually the “modern way” of walking (military) was brought to Japan at the end of the Tokugawa shogunate when the Japanese began to learn modern military warfare. Historically (sorry Mr Cruise), the first westerners to teach the Japanese samurai were the French military advisors, rapidly replaced by the Prussians after the loss of the 1870 war with Napoleon III. I often say that if we are centered in the tanden we can easily pivot like the hinges of a door. This is what I learnt by wearing the yoroi often. Footwork is the most important thing.